Eating healthy is complicated, right? Or do we make it complicated because of what we hear on the media? 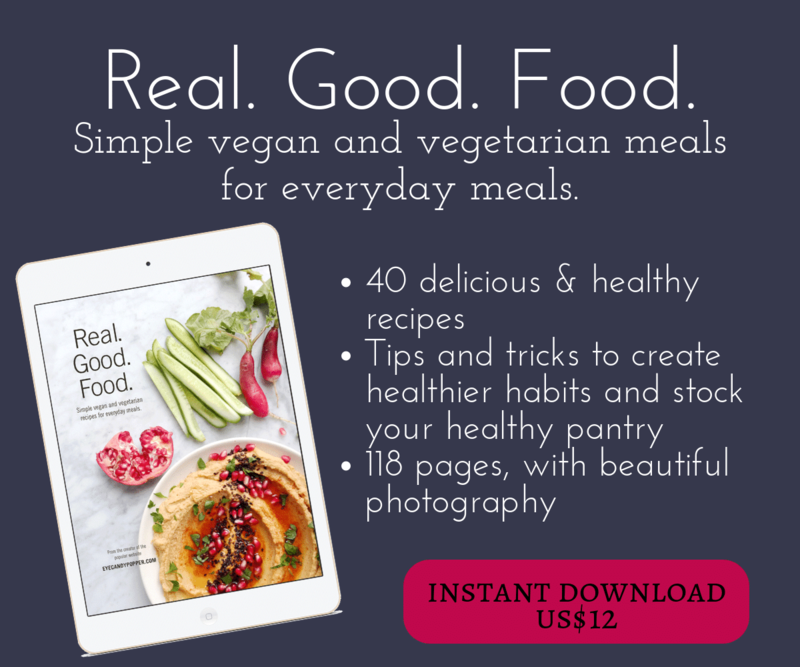 Too often, we think that we need to create an elaborate meal in order to be balanced and good for us, but that can become overwhelming, and in the end deter us from even trying, right? 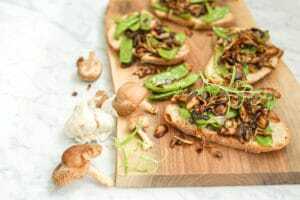 This simple recipe for Roasted Mushroom, Onion and Snow Pea Crostini is great for lunch or dinner and ready in about 20 minutes, with a handful of ingredients. I always think mushrooms are like the meat of the vegetable kingdom. haha Their texture is kind of meaty, and they can be prepared in similar ways to meat, they can be marinated and even cooked on the BBQ, and also, even though it’s not as high as meat, they do contain a fair amount of protein which combines with other vegetable-sourced proteins that you eat during the day, and form complete proteins or even boost the protein amount absorbed by your body. My favourite mushroom is shiitake because it’s one of the only ones that doesn’t disrupts our fragile internal yeast balance. Many people have yeast overgrowth in their bodies due to eating too much yeasted baked goods or having mold issues in their house, this can cause damaging inflammatory reactions. Shiitake mushrooms also contain a variety of vitamins and mineral, such as niacin, vitamin D and B vitamins, and have beneficial properties that can help to boost the immune system naturally. All in all, mushrooms are good for us and should be part of our regular diet, but I recommend using organically-grown mushrooms since many commercial non-organic mushrooms are sprayed with an additional preservative (formaldehyde is one of them) in order to keep them fresh longer on the grocery store shelves. Many people say they don’t like mushrooms, but perhaps it’s because they haven’t found a way to prepare them that they like? Roasting them well can be really enjoyable to eat as opposed to soggy. Looking for more mushroom inspiration? Check out this popular recipe for Potato, Mushroom, and Kale Hash Skillet, or these Simple Mushroom and Cranberry Vegan Pot Pie For 2. A simple but delicious healthy lunch or dinner, made with a handful of fresh ingredients, and ready in about 20 minutes or so. Can be made for 1 serving or doubled for 4 servings. Warm a large pan on medium heat. Chop your onion and slice the mushrooms while waiting for the pan to warm up. When warm, drizzle a generous amount of extra virgin olive oil and the chopped onion, cook for a few minutes until they start being translucent. Continue slicing the rest of the mushrooms while waiting. Add the mushrooms to the pan. Sauté everything for about 8-10 minutes or until the mushrooms start getting roasted to your liking. Mix in the thyme and rosemary (if using), snow peas and minced garlic, cover with a lid and cook for a few more minutes, mixing every 45 seconds or so (you might need to add a bit more olive oil if it's too dry). Toast your bread while the mixture is cooking. Mix in sea salt and pepper to the mushroom pan. Plate everything by topping each toast with the mushroom mixture. Serve immediately. Can you eat the pods? I’ve never had snow peas before. I had this for lunch the other day and it was SO good! 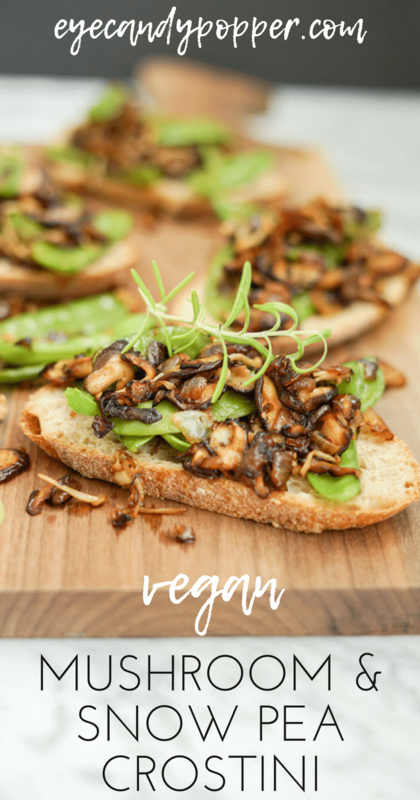 I will be adding this to my regular rotation to get more mushrooms in my diet! I *love* a good crostini, and this looks like just that. 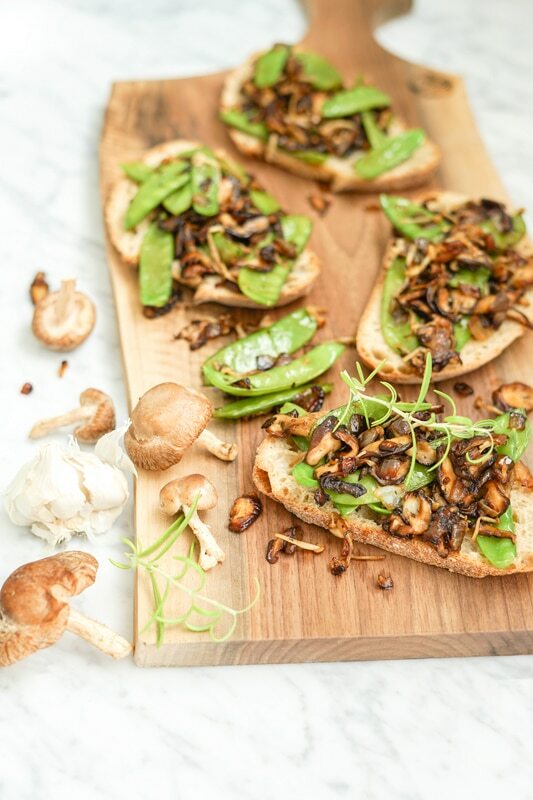 The savory garlicky mushrooms always add so much flavor — enough to not even need any cheese spread out on tat bad boy! You’re right, this crostini is tasty enough, no need for cheese on top! The snow peas keep it fresh! Shiitake mushrooms are so good! We buy our mushrooms from the same stand at our local Farmers market and they never disappoint. You are right, I don’t eat meat, and I often replace it with mushrooms. These crostini are pretty and with delicious flavors! Mushrooms are one of my favorite foods and this looks so, so appetizing! And as you say, they are super healthy… so a win win situation. 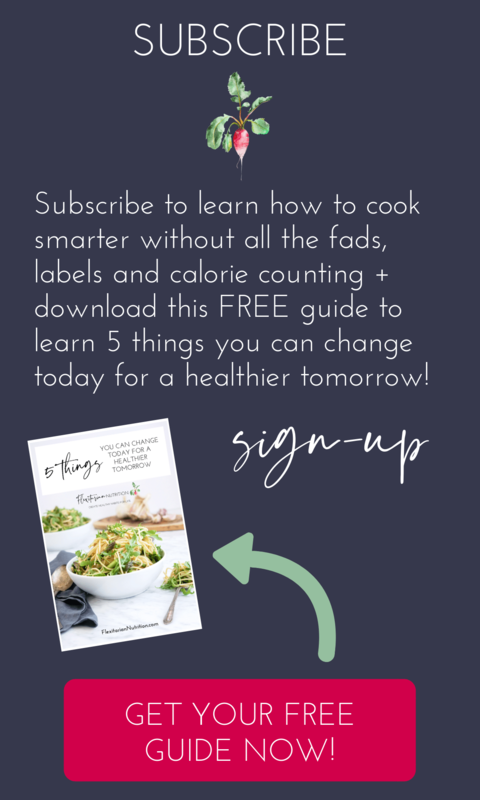 Have pinned to try. Thanks for sharing! I’m a shiitake fan, too! 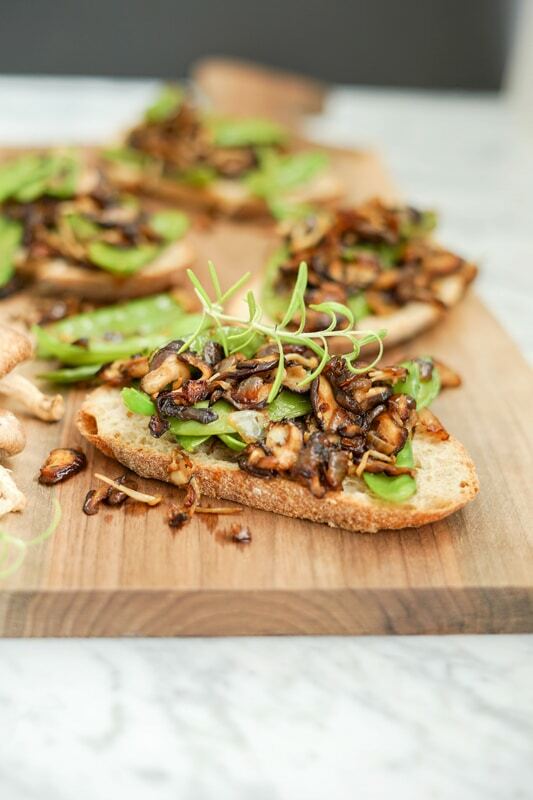 Love this contrast of the deep rich flavours of onions and mushrooms and light, crunchy snow peas! Pinned. Thanks Elaine! I’m sure you’ll love it! Haha, I’ve always thought of mushrooms as the meat of the veggie world, too. This post is making me hungry, it looks so delicious! I LOVE shitake mushrooms but admittedly don’t work with them enough. Just pinned this so I can give it a go with some delish gluten free bread this autumn. Love the contrast of flavours here! Thanks! I know you will love it! Very fresh and flavourful. Looks delicious, Gaby! I grew up hating mushrooms, but love them now. I totally agree that they’re meat for non meat eaters! Thanks! I was the same! Totally hated them as a kid, and now I make some every week!